Earlier last month I had the ingredients on hand for stuffed mushrooms. But realizing our ability to eat our weight in them we decided to instead make pizza. 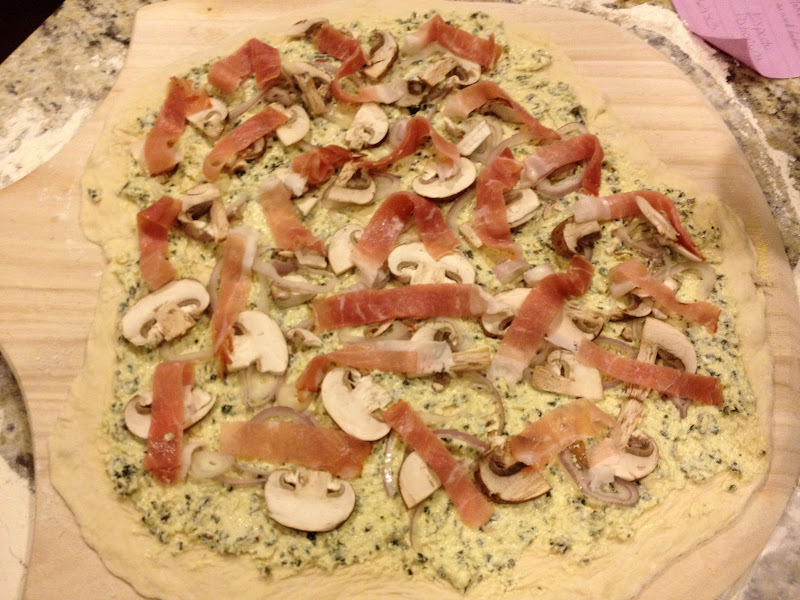 Basically it's a pizza crust with pesto and goat cheese topped with mushrooms and prosciutto. G declared it the best pizza I'd ever made, which is high praise indeed. 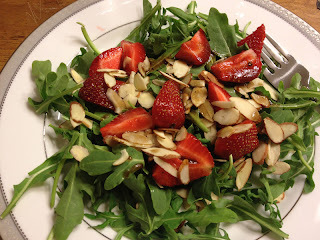 So tonight we had that with a salad of arugula with strawberries and almonds and a little balsamic vinaigrette. It was a little too strong flavored, and next time we'll use spinach instead, but it was worth a shot. I just ate the strawberries and then ate the rest. Pre-heat oven to 425°F (or whatever your dough recommends), with a pizza stone in there. Mix together the softened goat cheese with the pesto. Add olive oil if it's too thick, until it's sauce-like. Roll out your dough to the size desired (I usually end up with a 10-12 inch pizza). Dust pizza peel with cornmeal so that your pizza won't stick. Place the pizza dough on the peel. Gently spread the goat cheese and pesto mixture over the dough. I find a silicone spatula works well for this. Then it's time to assemble. Add mushrooms, shallot and sliced prosciutto. I recommend adding quite a bit of everything, but specifically the prosciutto because it crisps up a lot and you don't want it sparse! Slide pizza onto hot stone and cook for 20-25 minutes or until crust is browned and cooked crisp all the way to center. The cheese mixture will be golden brown. Let cool, slice and devour! That looks really good. I'm going to try the goat cheese/pesto base next time. It's so original!